Boo Boo blend helps cuts and scraps heal faster and decreases the appearance of scars and stretch marks. It's the perfect blend of Tea Tree, Lavender and Chamomile Essential Oils. How to Use: Although there are many ways to use essential oils, here are two suggestions: 1. Combine with a carrier oil (approx. 6-12 drops per oz. of carrier oil), and apply to desired area. Safety Tip: Undiluted oils should NEVER be applied directly to the skin or taken internally. Ingredients: Tea Tree Essential Oil, Lavender Essential Oil and Chamomile Essential Oil. How to Use: Shake well prior to use. Apply to temples, forehead, back of neck and reflex areas on the hands and feet. Ingredients: Boo Boo Pure Essential Oil Blend and Coconut Carrier Oil. How to Use: Shake well prior to use. Spray liberally on affected areas. Apply as often as needed. 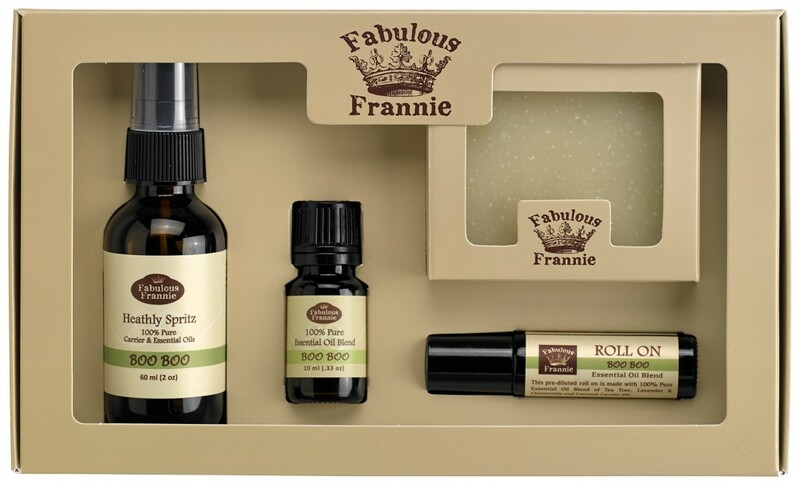 Ingredients: Grapeseed Carrier Oil, Coconut Carrier Oil, Tea Tree Essential Oil and Boo Boo Pure Essential Oil Blend. Product Tip: Allow soap to dry between uses by using a vented/ribbed soap dish or shower caddy. When dried properly, these bars should last four to six weeks. Ingredients: Olive Oil, Water, Coconut Oil, Organic Palm Oil, Safflower Oil, Tea Tree Essential Oil, Parsley Powder and Tocopherols (natural vitamin E).